You may have heard about Periscope, you may have watched it on your smartphone, you may have even used it yourself. But in this video, I’ll show you how to use your scope to drive traffic to you local business. There is nothing new about live streaming, but what makes apps like periscope so exiting, is that it allows you to steam live video straight from your smartphone to your audience’s smartphone. There’s no doubt that facebook and Youtube will follow soon, but you can jump straight into it using Twitter’s Persicope. I believe that this is a major game changer for local businesses and personal brands. Why? Because there are no longer any excuses to make videos for your business. Easy to use, takes little time, no expensive equipment to buy , no post production editing, no uploading online. 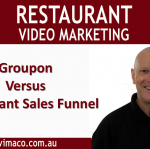 There is now no reason why any small business owner cannot make their own marketing videos. The other main reason, is that scopes allow you to connect with your audience like never before. I’m sure you’re very familiar with the old adage that ‘people buy from those they know, like and trust’. This is as true now as it has always been, and always will be. Its ingrained in our DNA our very survival depends on it. Live mobile streaming allows you to show you and your business behind your facade. Your facade could be your shopfront window or your website’s homepage which are used to attract your customer’s attention. But to develop know like and trust, you need to reveal what is behind that facade. You need to show your story of who you are and why you do what you do. You need to share your beliefs and values. By taking your audience behind the scenes of your business, you are allowing them see the authenticity of your business and that honesty and transparency helps to build that trust which is the foundation of a solid and productive relationship. When we talk about a productive relationship, we are talking about a two-way conversation. Live streaming allows you to have that conversation in real time. Your viewers can tweet there questions and give you instant feedback. This is ideal for you to demonstrate your expertise in your niche and really help your viewers by giving them real value. And the third part is your call to action. And because its live, there will be a sense of scarcity. If you own a restaurant, a cafe or a bakery or anything similar to that, you could have a scope showing your daily specials. Let you audience see it being cooked or prepared and you could do this before your lunchtime or dinner trade. Answer any questions about how the meals are prepared, tips on how they can create the dish themselves at home. Real estate agents could walk through a new listing and talk about the features of the house before an open inspection. A car mechanic can show the work he’s doing for on car such as fixing an oil leak and what to look for and that they are doing a free check up for the next few hours. A hairdresser might you show how they colour one of their client’s hair and they are offering a 20 percent discount for today. You might want to demonstrate a new product that has just come in and offer the first 10 customers in a bonus offer. You can see from these examples you can use your scopes not only to build trust by not only showing them behind the scenes and answering their questions, but with a CTA, drive traffic to your business, during a quiet period. So there you have it. Use your scopes to build trust be showing your audience behind the scenes of yourself and your business. Demonstrate your expertise by answering their questions and use CTA to drive them to your business when you want them to.